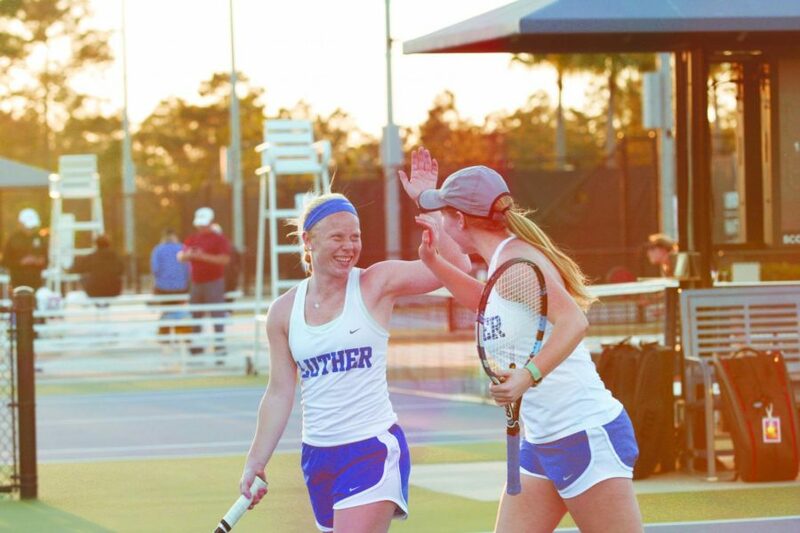 Ellie Hemker (‘20) and Megan Grimm (‘22) high-five on the United States Tennis Assocation National Campus courts during games over spring break. Members of the Luther Men’s and Women’s Tennis Teams spent the morning and early afternoon of March 20 shoveling snow off the tennis courts in the hopes of sneaking in one last practice outdoors, before they left for their spring break trip to Orlando, Florida. Some 36 hours later, they landed in Florida having snuck in said practices and were preparing for their first matches of the week. 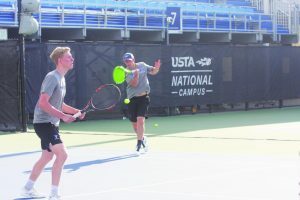 With temperatures hovering around the 80s and the sun blanketing the United States Tennis Association National Campus, both teams took to the courts to face-off against teams from Stevens Institute of Technology on March 21 and came home with winning records after the week of competition. Feelings regarding this transition from Iowa to Florida were perhaps most aptly encapsulated by Jake Smith (‘19). “As soon as we stepped off the plane, you knew: this was tennis weather,” Smith said. The matches against Stevens Institute of Technology were the first of five matches the men’s and women’s teams would play during the course of the week. The Luther men also played Calvin College, Hope College, Whitworth University, and Huntingdon College. The women played Calvin College, Pacific University, George Fox University, and Whitworth University. Jake Smith (‘19) and Brian Murman (‘19) play in Orlando over spring break. Prior to arriving in Orlando, both the men’s and women’s teams had not played matches for two and a half weeks but for differing reasons. For the women, the schedule is designed as such, given their fall season is slightly denser than the men’s. For the men, however, the weather had been uncooperative. Three of their eight scheduled matches have been cancelled, including the two immediately before the Orlando trip, due to inclement weather. According to Nate Parsons (‘19), Florida offered the prospect of consistency weather-wise with its distinct lack of snowstorms. While the Orlando trip is a means of playing guaranteed matches, it is also an opportunity to grow as a team. When not practicing or playing, members of the teams went mini-golfing, explored Downtown Disney, visited the Kennedy Space Center, swam, and grilled out at their residences for the week, conveniently located a short drive away from the USTA National Campus. The conclusion of the week saw both teams add wins to their overall record. The men’s side improved to 8-2 in the American Rivers Conference, losing their first match to Stevens 3-6, but finishing the week on a four match winning streak. Smith earned A-R-C Athlete of the Week honors for his performances in Orlando, winning all five of his matches. On the women’s side, Luther improved to 11-6 overall in the A-R-C, going 3-2 over the course of the week, winning against Stevens, George Fox, and Pacific. Both teams are hoping to continue these performances in the latter half of the spring season and into the A-R-C Automatic Qualifiers Tournament on April 26-27 for the women and May 3-4 for the men. For Britta Pressler (‘19) and the rest of the Luther women’s team, there are a number of important regional matches in the upcoming weeks. The men’s team, too, will be looking to continue winning moving forward. On Saturday, March 23, they defeated Hope College, ranked just below Luther, 6-3.